This stunning turquoise ring is handcrafted Navajo work. Date of creation late 1950's to early 1960's. 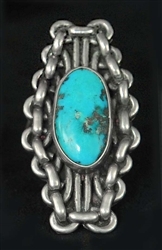 A beautiful, natural Blue Diamond turquoise stone with black augite matrix, is set in a smooth bezel. Very unique silver work frames this amazing stone. A heavy double split shank. 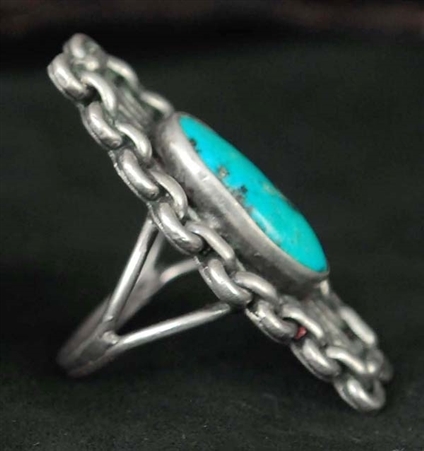 The ring is a size 9 1/2, with the top ring measurement (silver & stones) of 1 3/4" long by 7/8" wide. A very attractive stone, in a very unique setting. Not hallmarked.